Unveiled at the 2001 Milan Show, the Blue Marlin is an advanced prototype model designed in collaboration with French company Boxer Design. It uses a back-to-basics approach to provide a rawer sportsbike experience. The 60° V-twin engine common to all of Aprilia's large-capacity bikes is housed in a steel-tube frame with aluminium rear plates. The line of the frame continues back up to the tail unit, in the style of race machines from the 1950s and 1960s. 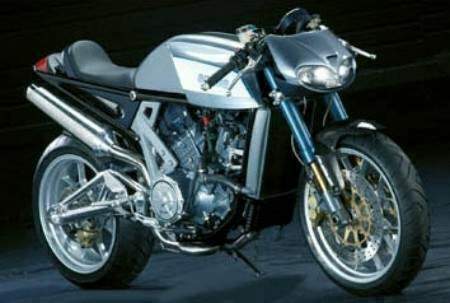 There are modern elements to the design too, with an aluminium tube swingarm, upside-down front forks and a purposeful twin headlamp nosecone. While the Blue Marlin looks simple, its components are very high quality, including Öhlins suspension and Brembo brakes. 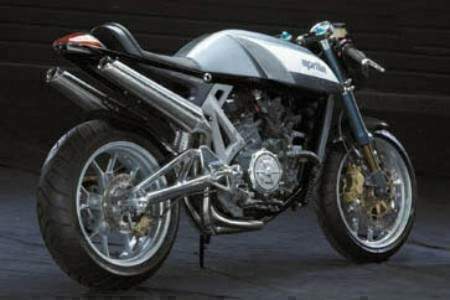 Inspired by the past, technology and sporty performance Aprilia has created a genuine "concept bike". 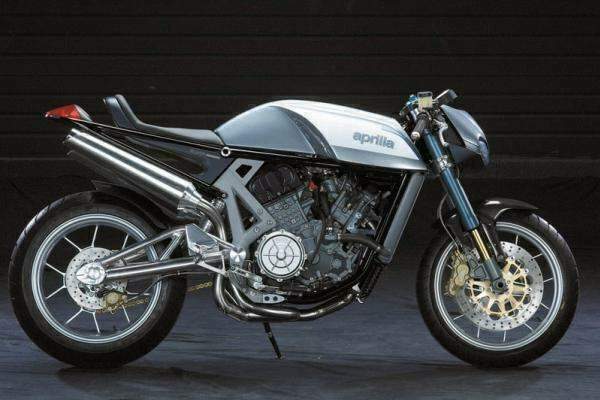 the Aprilia 1000 Blue Marlin is a new concept naked-sports bike, taking its form in a design sheet made up of creativity, innovation a deep passion for the motorcycle and close attention to an ever more demanding clientele. 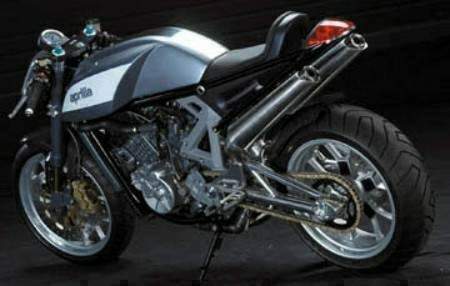 The Aprilia 1000 Blue Marlin has tapering, aerodynamic lines. Its essential design is emphasised by the complete absence of any fairings. This enhances the sensations identifying the very soul of motorcycling. Aprilia's technology and experience gained in both the racing world and production of standard bikes now makes it possible for new and important goals to be achieved. The mechanics of the Aprilia 1000 Blue Marlin have been conceived to emphasise the heart of the bike, the RSV 1000 60° V twin. the double cradle perimeter frame is made from chrome/molybdenum tubing drawing on concepts and technology from both the off-road and track world. the result is an ultra-lightweight frame with high torsional rigidity enabling the engine to utilise its high power output to the full. The distinctive and exclusive double cradle design allows for saddle mountings and rear shock absorber and swingarm mounts giving enormous advantages in terms of weight saving and dimensions. The frame also houses the oil tank, built into the bottom cradle. the rear gas shock absorber without springs and levers leaves the maximum possible space for the exhaust and therefore not compromising the essential lines and the bike's distinctive design. Emphasising the concept of lightness and clean lines is the new tubular aluminium truss swingarm with its streamlined wedge shape, a genuine masterpiece in essential design and lightness. the dashboard provides further confirmation of the concept of every individual component of the Aprilia 1000 Blue Marlin. A perfect mix of classical and modern analogue and digital instruments guarantees ease of reading and complete information. The components used on this bike are the best available on the market. From the Öhlins upside down Ø43 mm fork with 120 mm travel to the Brembo braking system with double 320 mm floating discs and four pod calipers at the front and single 220 mm disc with two pod calipers at the rear.